Help at Hand’s Annual General Meeting: was attended by the usual faces; it was a shame not to see many new faces but it was nice to catch up with everyone. Despite there having been a fall in the number of trips booked last year (241 compared to 273 in 2017) it had been a good year with a small surplus made during the year. This was a result of donations received from users and drivers as well as profits from the Cream Tea last summer – thanks were once again said to Linda Boustead for baking all the scones and to Ian for donating the cream and jam. Ian also thanked Les and Christina from the Hardware Shop for being the first point of contact for anyone who needs to make use of the services of Help at Hand – by calling the Shop, they are able to provide contact details of the daily duty officer who will then be able to find a driver to take you wherever you need to go. He went on to say that as a result of last year’s meeting, three new duty officers were recruited whilst one had informed him of their intention to stand down after some 20 years of service. He confirmed that the number of drivers currently on the books was adequate but it would be helpful if they could recruit a couple more to ensure cover should anyone be unavailable due to holiday or illness. A request was made for a volunteer to join the Committee – not an onerous task as they only hold a couple of meetings a year, usually before the AGM and again ahead of the summer’s Cream Tea, along with helping out on the day of the Cream Tea. The current Committee was re-elected on bloc and a member of the public agreed to join them, which was welcomed. The date of the Cream Tea was announced: Saturday, 13 July between 3pm and 5pm in the Parish Hall as usual. A request was made for donations to the raffle – a sure way to boost profits on the day! If you would like to donate a prize, please get in touch with Ian on 400763. Finally, Ian mentioned that Help at Hand did have some funds available to help any local organisation or club that could benefit from an injection of cash to help them in the short term, for example to replace a piece of equipment or to help fund an outing for members. 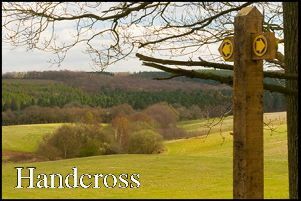 If you know of any such need, not just in Handcross, they would be happy to help anyone in the Parish, ie Pease Pottage, Slaugham or Warninglid, get in touch with Ian and he will discuss it at the next Committee meeting. It is that time of the month: again for those of you who like to knit and natter! The group will be meeting this afternoon, Thursday, from 2.30pm in Dudley House, next door to the Hardware Shop. Light refreshments will be provided for a suggested donation of, I think, about £2 which is very reasonable for a cup of tea and a slice of cake! More details can be had from Christina in the Shop. The Parish Council: meeting last week came up with some dates for the diary, the first being Tuesday, 23 April when the Annual Parish Meeting is planned. This is the meeting when the Council updates the parish on what they have been doing for the past 12 months and what is planned for the next 12 months. It is also the meeting when they invite someone who is associated with the village to give a talk on what their organisation has been up to or what it is planning; if they are able to get the person they were talking about inviting, it should be very interesting – keep your eye on the website (www.slaughampc.co.uk) for more information. The second relates to the opening of the new hall at Finches Field, Pease Pottage; you may recall I had previously suggested that this would be happening last weekend which obviously didn’t happen! Hopefully, it will happen on Saturday, 27 April – again, keep an eye on the website. Finally, a date was also mentioned for the referendum on the Neighbourhood Plan! As things are moving along nicely with the Inspector and Mid Sussex District Council, it is hoped we will be able to vote on it by 25 July. As always, if and when I hear more about this, I will pass it on. The Parish Council: will be meeting this evening, Thursday, from 7.30 pm in the Pavilion on the Recreation Ground. As always, the agenda can be found on the Council’s website or a copy should be on the notice board outside the Spar Shop. If you make a habit of looking at this notice board you will have seen something about becoming a Parish Council member. If this is of interest, and the Council does need some more members to ensure a varied and unbiased view of everything in the Parish, go to the Council’s website, www.slaughampc.co.uk and click on the link on the home page ‘Notice of Election’ where you will find further information – you have until 4pm on Wednesday, 3 April to submit your nomination forms; go to www.midsussex.gov.uk/elections for further information on how to get and submit an application form. The elections for this will take place on 2 May, the same day we have the opportunity to vote for our district councillors. For your information, we currently have 8 parish councillors when we can have up to 13. The villages of Handcross and Pease Pottage between them can have 10 councillors, they currently have 6; Slaugham and Warninglid can have 3 and currently have 2. So, if all current councillors agree to re-election, there are vacancies for a total of 5 councillors but I think there may be one or two stepping down so there might be a need for more. You don’t have to be qualified in any way to become a parish councillor, you just have to be interested in local affairs and I suppose want to give something back to your local community. If this is something of interest, why not go along to the meeting this evening to meet your current councillors and see how a meeting is run. I hope to see a few more people attending, it gets lonely being the only member of the public attending each month! It is Knit & Natter: this afternoon, Thursday, at Dudley House (next door to the Hardware Shop) from 2.30pm. Do go along if you are looking for something to do and have some knitting on the go, or even if you don’t but fancy some company, you would be made very welcome. There is a small donation asked for to cover the cost of the refreshments on offer (£2/£2.50). If you would like more information, get in touch with Christina (400212) and she will be able to help you. The celebration: in respect of the opening of the refurbished Parish Hall was a great success on Saturday afternoon; as always, it was a shame that more people didn’t turn up but those that did were greeted with a glass of fizz which made a very pleasant change to tea and coffee! Everyone had a good word to say about how bright, clean and most importantly to those who have used the Hall in the past, how warm it was! I think that the money that has been spent on putting in an up to date heating system with modern day, efficient radiators, has really paid off, but that is not to say the redecoration and new lights isn’t appreciated, it all is. The icing on the cake was the announcement by Tim Arnold, Chairman of the Management Committee, that he signed a new lease for the Hall on Tuesday last week which ensures we have it for the next 5 years – hooray! It has taken some time to get there but we now have it and that is all that matters, some peace of mind for the next few years. Handcross Ladies: had an enjoyable evening learning about felting and how to make your own in the newly refurbished Parish Hall last week when they also welcomed two new members. Next month’s talk will be from Canine Partners which I am sure will be just as enjoyable and informative. If you would like to learn more about this organisation, get in touch with them by email on handxladies@gmail.com or go along to their next meeting which will be on the third Tuesday of the month being the 19th from 7.30 pm. I have now experienced the improved Parish Hall: myself and was very impressed by how much brighter it was and certainly how much warmer it was! I was lucky enough to enjoy the lunch put on by the Outing Club in the Hall last Saturday and very good it was too! I think just about every member of the Club was there to enjoy a two course meal followed by tea and coffee that was served to us as we sat at beautifully laid tables – thank you to whoever was responsible for the flower arrangements, it was such a lovely touch. At the end of the meal after a free raffle, we were entertained with a slide show of photographs taken over the years showing the various holidays and outings members have enjoyed. We were also given a schedule of the outings planned for the coming months, the first being on Wednesday, 24 April to Brighton & Hove Dogs costing £16 with a two course meal being available at a cost of £8.45. If you didn’t put your name down but on reflection would like to go, get in touch with Brenda on 400081. The other trips planned are as follows: 12 May – Scotney Castle, £28 (if you are a member of the National Trust, it will only cost £17 for the coach); 12 June – Postal Museum, London, £31 (you will need to be able to walk short distances for this one); 14 July – Leeds Castle, £33; 18 August – Camden Canal Cruise; 22 September – Marwell Zoo, £37. It is a little early for pick up times to be advised but all I would say is if you put your name down for any of these outings but drop out at short notice without paying, the Club will still have to pay for your seat on the coach and are therefore losing money on the outing, something to bear in mind. A big thank you to the committee for all the work you do over the course of the year and for organising such an enjoyable lunch. We are at that time of the month: when the various clubs and groups seem to hold their meetings, in the middle of the month. The first of those is the Knit & Natter group which meets today Thursday at Dudley House, next door to the Hardware Shop from 2.30pm. This is a small friendly group who meet once a month to catch up on the gossip whilst enjoying their knitting or just going along for the company. There is a small cost involved to cover the cost of the homemade refreshments offered (in the region of £2/£2.50 I think) but if you would like to know more, ask Christina and she will point you in the right direction to get all the information you need to join this group. Parish Hall: I owe you an apology! It would appear that I jumped the gun somewhat by saying last week that the Hall would be open for business on Monday; those of you who were expecting to be in for a meeting this week will know this has not been the case and I’m sorry for any confusion my comments may have caused. It would appear that whilst it was hoped the Hall would be open this week, there were still one or two things that needed to be done and rather than take a chance, it was decided that it would be better to leave it for another week. Thanks to Julie at the Social Club for helping out at short notice this week and for the last month as well. Last week’s Parish Council meeting: was interesting on two counts: firstly there was a gentleman attending who was talking about plans for a new free school in Mid Sussex to cope with the growing population and concern about possible catchment area changes affecting Warden Park School in Cuckfield. The plan is to open a new school in partnership with the Hugh Latimer School in London; they don’t have a site at present but are looking in the local area, Pease Pottage being mentioned as a possibility. I understand they are due to have a meeting in the not too distant future with the authorities and by the time of the next Parish Council meeting in February, they hope to have more news. If you would like to learn more in the meantime, have a look at their website, www.hughlatimerschool.org.uk, otherwise make a note of the date of the next Council meeting on Thursday, 28th when it is hoped there will be another presentation. Handcross Ladies Association: started the New Year with a well-attended AGM last week. Once the ‘business’ element of the meeting had been completed, members were entertained with an interesting talk and slide show on Frost Fairs which was enjoyed by all. Whilst their meeting this month was held in the Social Club, next month they will be back in the newly refurbished Parish Hall for their meeting on the 3rd Tuesday of the month, more details nearer the time. Neighbourhood Plan: as mentioned last week, you have until midnight on Monday, 14 January to make any comment on the Plan if you disagree with it in any way. I am aware that some feel that we do not need to include any provision for further housing in the parish. Whilst I appreciate that as things stand today and what MSDC have said, our needs are currently met. However, what we seem to have lost sight of is the fact that this Plan is covering our needs for the next 10, 15 or more years not just the next 5 years! So whilst it would appear we are more than covered today, if we don’t show we have thought of what might change in the future, we could get well and truly stung with so much more development with nothing to fight it with. Please, speak to those who have put the plan together if you have any questions as I can assure you that they have tried to consider every possibility that might happen, not just in the next 5 years but much further into the future. As promised, opening times over the Christmas period for some of the shops that you might need to use: The paper shop will be closed on Christmas Day and Boxing Day as well the afternoon on New Year’s Day. The Hardware Shop will be closing at 4pm on Christmas Eve, opening again on New Year’s Eve and then normal service will be resumed on 2 January 2019. Handcross Butchers will be open on Saturday and Sunday between 7 am and 3 pm and then on Christmas Eve between 6 am and 2 pm for you to pick up your Christmas orders. They will be closed Christmas Day and Boxing Day, normal hours Thursday to Saturday, closed on New Year’s Eve and New Year’s Day and again normal hours from 2 January 2019. The Spar Shop will be closing at 6 pm on Christmas Eve, closed on Christmas Day and Boxing Day, normal hours until New Year’s Eve when they will close at 6 pm, reopening on 2 January 2019. If you were thinking that you’d get out of making sandwiches for your lunch between Christmas and New Year by purchasing from Picnic, I’m afraid you’re out of luck as they will be closed from tomorrow, Friday, reopening in the New Year. I have heard: that the contractors have started work in the Parish Hall ahead of the closure on 20 December. If you have booked the Hall for an event before then, please do not worry as any work that starting now is being done around all existing bookings. I am also aware that rumours are going round that the prices will be going up to pay for this work. On behalf of the Management Committee, I can confirm that there are no plans to do this. Through past fund raising efforts when it was thought we were in line to get a new hall, there are sufficient funds to cover the cost of this work in full, so please rest assured if you are thinking about booking an event once the work has been done, it will be at the same price as this year. If you have any questions or concerns about the future of the Hall, please feel free to get in touch with me either by email (see above) or give me a ring on 07887 535638. The pick-up times: for the Outing Club’s trip to Brighton on Sunday for the Carol Concert in Brighton are as follows: Haywards Heath 1.45pm, Cuckfield 1.50pm, Staplefield 1.55pm, Truggers 2pm, Windmill Platt, 2.05pm and finally Pease Pottage at 2.10pm. As always, if you could try to be at your pick-up point a little early it would be appreciated. For those of you who are wondering about the lunch that was initially scheduled for January in the Parish Hall now that the Hall is due to be closed that month, it has been rescheduled for Saturday, 16 February 2019 12.30pm for 1pm. If this is going to cause you a problem, please get in touch with Brenda as soon as possible on 400081. Neighbourhood Plan: I was going to say that I will be going along to the Parish Council meeting this evening (7.30 pm in the Pavilion) to get an update on where we are with the Plan but I already know! I was walking past the Spar at the weekend and glanced at the Parish Notice Board and saw the notice from Mid Sussex District Council announcing that they had published the submitted Plan “for consultation in accordance with Part 5 of the Neighbourhood Planning (General) Regulations 2012” and that the consultation will run from 19 November 2018 until 14 January 2019! We are getting closer to the finish line! It went on to say that “representations made on the Slaugham NDP will be considered by an independent examiner who will assess whether the NDP meets certain legal requirements, known as the ‘basic conditions’. It then goes on to list the various documents that have been submitted as part of the Plan. If you would like to know more and have access to a computer, if you go to the MSDC website on the link https://www.midsussex.gov.uk/planning-building/neighbourhood-plans/ and click on Slaugham, you will find full details of what has been submitted. You will be directed to the parish website for details of the background to the Plan and finally, information on how you can register your comments online, by email or post. If you don’t have access to a computer and would like to have a read of the Plan, guess where to find a copy locally – yes, the Hardware Shop! Where would we be without Les, Christina and the rest of the team that work in the Shop! You should note that if you want to register your comments, you have until midnight on 14 January 2019. As I said earlier, the finish line is almost in sight, let’s hope we can get over it this time! The Coffee Morning and Table Top Sale: last Saturday morning in aid of Handcross Ladies Association and Handcross Preschool was very well attended which was nice to see. At the time of writing the adding up hadn’t been done so I will let you know how much was raised next week. All money raised will be split between the two local organisations. It is always good to see the Hall full of people enjoying themselves, especially younger families who will hopefully get more involved in hosting such events in the future. Ian and Jane: had another successful Big Breakfast the other week when they hosted their usual social event on the morning of the London to Brighton Veteran Car Run. Together with their guests just shy of £600 was raised through the purchase of raffle tickets and donations; over the numerous years they have been hosting this very social event they and their guests have raised around £10,000 all of which has been used to help local projects and charities. The most recent ‘purchase’ has been the two defibrillators that we now have in the village. I say ‘purchase’ because the first one was donated by the Sussex Heart Charity, the cost of fitting it to the Hardware Shop had to be funded and the second outside the Royal Oak was purchased with Handcross Residents Association funding the installation costs of this one. Thanks once again to everyone involved in getting this very important equipment installed in the village, we are very lucky to have them but hopefully there will be little if any need to use them! Members and guests: of the Social Club enjoyed a Race Night back in September in aid of Dreams Come True Children’s Charity raising an amazing £632 on the night! Congratulations to everyone who attended and I’m sorry I haven’t mentioned your good work earlier.